Groups plan protest following mayor’s ‘no gays here’ statement. Rally could stoke already heightened tensions amid voter fraud scandal. Groups representing gay and lesbian Israelis are planning a protest in Beit Shemesh in response to Mayor Moshe Abutbul’s recent claim that there are no homosexuals living in the city. Abutbul told Channel 10, “We don’t have things like that… thank G-d, this city is holy and pure.” He suggested that the Health Ministry or police could deal with homosexuals elsewhere. His comments came as tensions are running particularly high between hareidi-religious and non-hareidi residents of Beit Shemesh due to allegations of widespread fraud during the recent municipal elections. Abutbul won the hotly contested elections by under 1,000 votes. Gay activists responded Sunday with a statement saying, “The mayor of Beit Shemesh says that there are no gays in his city. He’s asked the police to deal with this phenomenon. “Well, we talked to the police, and they’ll deal with us – with a pride parade that we will hold this upcoming Thursday. “This is the moment to show our power as a community. This is more important than any party, or any march we were in over the summer,” read the announcement, which was circulated on social media networks. 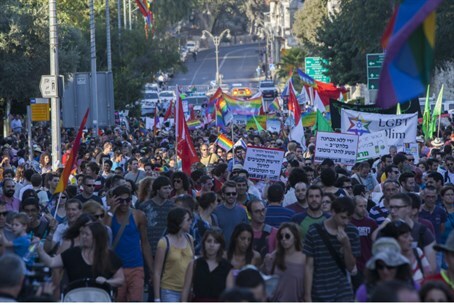 The annual gay pride parade in Jerusalem has led to tension between activists and the religious community in that city, and there are concerns a similar move in Beit Shemesh could stoke tensions further in that city as well.